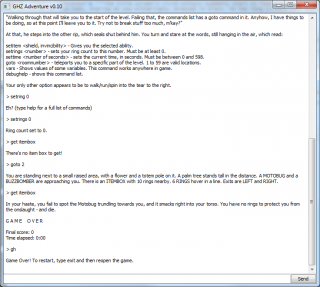 GHZ Adventure is a tongue-in-cheek Sonic the Hedgehog fan game created by Overlord for April Fool's Day 2011. The gameplay of Sonic the Hedgehog's Green Hill Zone is re-interpreted as a text adventure game instead of the usual graphical layout. In the game, Sonic fights badniks such as Crabmeat, Buzz Bomber and Chopper while gathering rings and moving towards the end of the map. Standard Sonic gameplay features, such as invincibility and shield monitors, spin attacks and the classic HUD are all available. The game itself is compiled for play on Windows systems, but a Python version was also released, allowing for Linux and Mac OS X players to also enjoy the game. The game is open source, GPLv3. This page was last edited on 10 April 2018, at 13:09.